Our weather took a dip recently and it's starting to feel like winter. Just to the west of us even had a massive ice storm last night. Thankfully it was only miserably cold and rainy here. A perfect day/night to stay tucked safely indoors with my knitting. And speaking of weather and knitting... I got to add in a new color stripe on my weather cowl. Well, not new, but the first medium blue stripe of the season. For some reason, I'm quite excited about it. I can not believe I've kept up with this weather cowl. 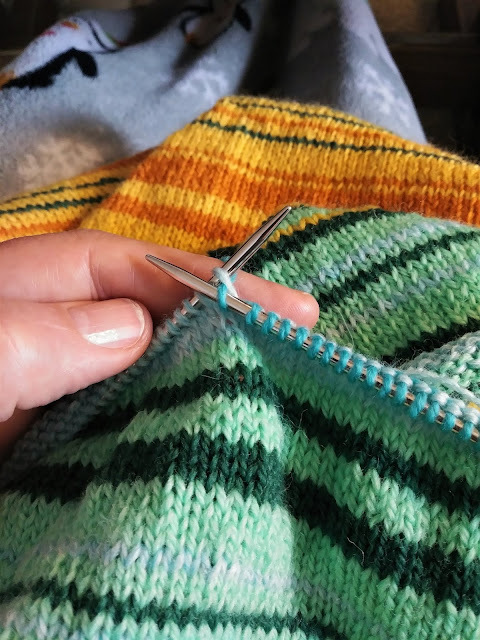 When I started it, I had no real hope of actually knitting a stripe every day indicating the day's temperature. Thinking that I'd never follow through on the project for more than a week or two, I didn't spend much time choosing the colors. I simply grabbed skeins from the stash pile, assigned temperature grades to them and started knitting. I deeply regret that decision now. There's not enough contrast between the light green (54 - 66 degrees) and the light blue (44 - 53 degrees.) Even up close and in person you have to really look to see the difference. And don't even get me started on how harsh the dark green (67 - 77 degrees,) yellow (78 - 88 degrees) and the orange (89-95) stripes are. I'm generally not a big fan of green but on your weather cowl it looks wonderful! your striping is lovely and I am on a big cowl obsession. I still have three to knit as gifts and now I'm thinking about what I want to knit for me. I can not wait for New Year's selfish knitting! My list of projects is long but I've already bought yarn for 6 of items. I doubt I'll knit another, but I have been wondering what I'll do with the 10 - 15 minutes a day I've been spending on the weather cowl. It may turnout better than you think. I see what you mean about how close some of the colors are, but when it's all done that subtlety may look like genius!